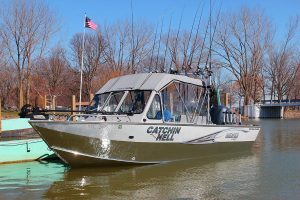 Saginaw Bay: Has good walleye fishing off Linwood. Boat anglers are using Hot-n-Tots, husky jerks and reef runners. Saginaw River: We have reports of walleye being caught by boat and shore anglers up near Wicks Park. Tittabawassee River: Boat anglers caught walleye between Midland and Saginaw. Pine River: Perch are still being caught in good numbers (near Standish). Lot of keepers right before dark. Green perch rigs with minnows. Au Sable River: Is producing the occasional steelhead. Au Gres River: Anglers are catching perch down near the mouth. Most are using perch rigs with minnows or small jigs. Oscoda: Pier anglers are still taking steelhead as the fish continue to move in and out of the river system. Weekly Fishing Tip: Are you ready (and prepared) to go ice fishing? Several parts of Michigan should hopefully have ice in the coming weeks, thus providing anglers with an opportunity to go fishing during the colder months. Will you be joining them? Then it’s time to get prepared to head out safely on the ice! Pick your preferred ice fishing technique and the species you wish to target and brush up on your skills – whether that is hook-and-line fishing for bluegill, sunfish, perch or crappie; using tip-ups for northern pike, walleye or trout; or spearing for northern pike, muskellunge or sturgeon. You should always stay safe when heading on the ice. These five tips can help: 1) Never fish alone; 2) Tell someone where you are going and when you expect to return; 3) Always test the ice with a spud; 40 Take the appropriate emergency items, such as a lifejacket and ice picks; and 5) Take a cell phone with you in case you need to call for help. Keep it in a plastic, sealable bag to make sure it doesn’t get wet.